Hard Case Cover + Keyboard Skin + Screen Proctector For MacBook Pro 13.3" 15.4"
Snap onto your Macbook Pro in two form-fitting pieces. Also subject to change especially during peak periods. Includes Case only. Condition : New, sealed item. Never opened. 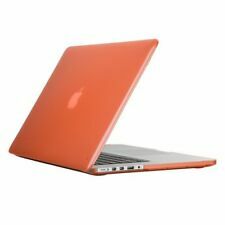 Hard Rubberized Laptop Shell Case + Keyboard Cover For Apple MacBook Pro 13" 15"
IBenzer® Soft Skin™ Hard Case Series. Apple Macbook Pro 13" with CD-ROM (Model: A1278). • Super light-weight full protection solution for the exquisite finish of the Apple Macbook. The case only fits for Macbook Pro 13" with CD-ROM (A1278) NO CUT OUT design. Shockproof Laptop Case+ Rubber Keyboard Cover For Macbook Retina 12" 13.3" 15.4"
Hard Frosted Rubberized Shell Case Cover For Macbook Retina 15.4" 13.3" 12"
Slim Laptop Shell With Soft Keyboard Cover For Macbook Retina 12" 13.3" 15.4"
Studio C Chevron On Macbook Pro Air Laptop Sleeve Notebook Case Coral/Linen 16"
This Studio C Chevron and On laptop sleeve has a gloss-laminated, water-resistant polyester exterior for extra durability. Polyester taffeta lining Cradles your laptop to help prevent scratches. Linen material For a strong and durable design.